In 2005 my Russian wife wants us to have aquarium in the living room, but I was not so interesting. I was sure I have ending my time with fishes and aquarium in 1997 and I was not so interested to start again. My flimsy excuse was that it was so expensive to buy aquarium, the equipment, plants, fishes and all the work with cleaning the aquarium. But my wife want aquarium because she was used to her father's aquarium in Moscow. I try buying a used aquarium and was calling a friend I have given all my aquariums to in 1997. I was asking about buying back my old 325 liters aquarium. You can borrow it, I don’t using it. I was thinking this are better, then I not need to buy and it is possible to giving it back. We were buying plants, filter and fishes in the beginning of Mars 2006. When we were in the shop we were seeing the bunch of Asian discus. 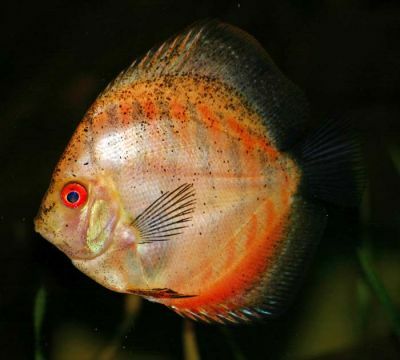 I want them, but not this ugly orange discus. My wife like they very much and I had to buy them to her. The first month I was not get the old feeling of the hobby, but the next month it was happen something inside me. I have all the time dined that I was starting with aquarium and the hobby again; I say it was only a aquarium in the living room I want. I began to study the discus we have purchase and begin to compare them with the type of discus I had before 1997. The only I know before was red turquoise, the blue turquoise and this pigonblood I have not seen before. What kind of mix discus have we purchase, I begin to wonder about? What I have before 1997 was brown, blue and heckle discus. I had been absent for 10 year and I have not a clue about what have happen with the discus spices during this time. I was beginning to be curious about what have happen. Because also these beef heart food for discus they also pushed on us when we buy this discus in the shop was new for me. WHAT HAVE HAPPEN WITH THE DISCUS I KNOW BEFORE? In that moment I think I lost my indignation about the hobby. I begin to look much more in to other aquarium shops about what type of discus they had. Then I was seeing brilliant red turquoise discus in a shop. I was buying four of them and very soon I was seeing that it was a couple among them. Then I have to call my friend again to ask to borrow one of my other old aquariums. I can give you back your old 270 liter he said and this was the aquarium I had in my mind and want back. Very soon I had installed the aquarium and after a month I transferred the couple to the aquarium. Only after some days they start to lay eggs. I was feeling the interest for the hobby begin to blossom inside my mind again. I ask myself, is it possible to have fry of discus again? My wife was felling the same interest to see what happen in our aquariums with the discus and also she begins to look to have discus fry. But very soon we get disappointed because it was some trouble in this couple. The male was all the time chasing the female away from the eggs and he did not take care of them. Always the eggs go moldy and none fry was to see. This happen about 10 – 15 times. Then I try one of the other males with the female, but they did not lay eggs. Then all this stopped because we were buying a new apartment with basement and was going to move. Planning of a new room for aquariums in the basement started. But the disappointment with this manmade discus was deeply born in my mind. 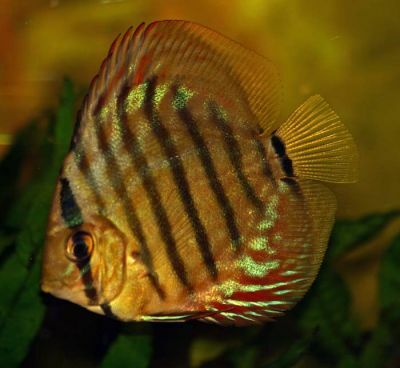 What is wrong with this type of discus? 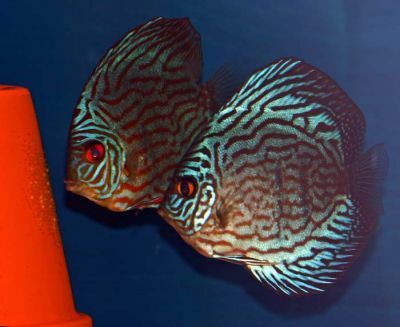 This ask I was going to investigate and all the answer I found will forever banding this type of manmade discus in my aquariums. But I am very interested to learn about how they develop this mutants and variants. Some I know but it is difficult to see the true information in the big lines in this information. It is very easy to suspect use of hormones and also gen-manipulation in this picture whites I was thinking about with the early mutation of yellow PigeonBlood variant. Then you show me in Book I in page 195 - first picture a yellow variant of S.haraldi from lower parts of Xingü. I don’t believe what I was seeing, but you show me information so I have to change all my thinking about what I have believed about how they have developed this mutant and variants. It was really a natural yellow Discus. Earlier you have give information that the most of this mutants and variant made by human have its origin in variants of S. haraldi. Then I ask myself, is it possible to see what types of variant they have use in the developing of a variant in the youngster from a mutation and variant couple? 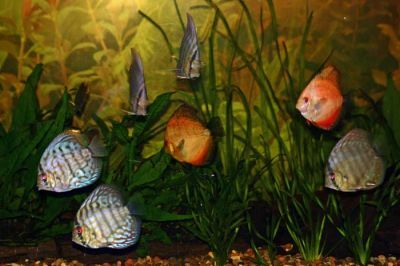 "Anyhow, almost all of the tank breed variants in the hobby around the world and those mutants are from S. haraldi, very few (only the red spotted) are from S. aequifasciatus and practically none is from S. discus – except the so called Heckel-cross and all Asian so called S. discus are from Heckel-cross or just wild blues. You see the S. haraldi was always the most easy to breed, since before World War II (coming up in volume 2), simply because this species is found in the most similar water parameters as to the rest of the world. Therefore everyone breed those. Green were always much more difficult and Heckel-discus, well you know..."
So it could be possible to breeding back or see some of the origin and the variants how have been used in developing on of this mutation and variant. Today it’s hard to get a clear picture and information about what happen with the Discus as a spacie. This starts about 30 years ago when they begin to develop all this new strain’s, what I see and feel today are very much ugly mutants and variants. In this type of what they call ”Discus” I don’t see the natural color’s, paten’s and the natural behaviour of the genius Symphysodon. Today, there have been 35157 visitors (90848 hits) on this page!